He may not be "the night," but he's definitely terror! Unlike some characters, Scarecrow wasn't really reimagined when he was brought into The Animated Series - Dr. Jonathan Crane, obsessed with the psychology of fear, exposed people to their deepest phobias, but his colleagues felt he went too far and he was fired. In the comics, he merely killed the faculty members who supported his firing; in the cartoon he went for a less mundane revenge, stealing from the university to cripple it financially, then plotting to steal the money from the school's fundraiser. That's smart! 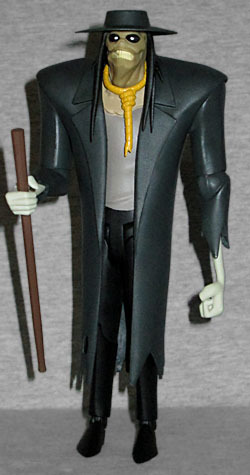 This particular figure is based on the Season 4 episode "Never Fear," which sees Scarecrow getting even smarter. Realizing that fear is a normal part of everyday life in Gotham City, he reverses his tactics, opting to remove people's fear entirely: the fear that keeps them from walking into traffic; the fear that keeps them from breaking the law; the very fear that Batman uses as his primary weapon against crime. With all fear gone, Gotham would descend into anarchy. 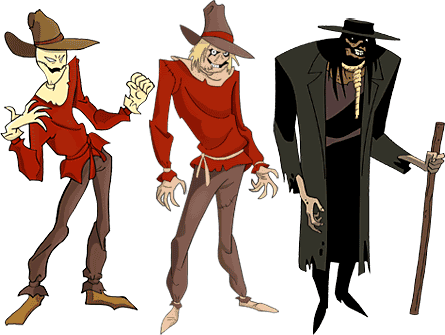 Scarecrow had three different designs in Batman: the Animated Series. The first was a frankly terrible and uninspired look, basically with just a sack over his head and awkward anatomy. 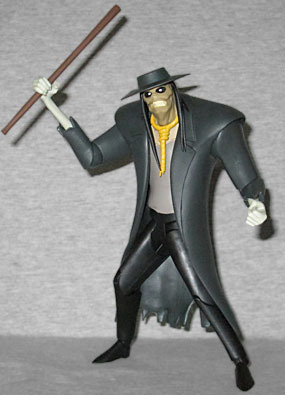 Bruce Timm hated that original design so much, Scarecrow became the only character to get redesigned during the first three seasons - his more familiar look added more detail to the mask, so you could write it off as Crane coming up with his first costume on the fly, then improving it when he had time. The second redesign took things even further, turning Scarecrow into a weird mix of an old west preacher and Leatherface, and that's what we get here. 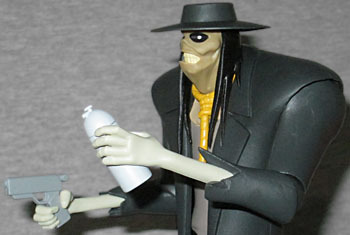 Unfortunately, it doesn't work in the figure's best interests - while the animated face could be a creepy mix of shadows and highlights, the toy is doomed to be a physical object, with a specific, permanent shape. It certainly looks creepy, but not as... rotten as the drawings did. 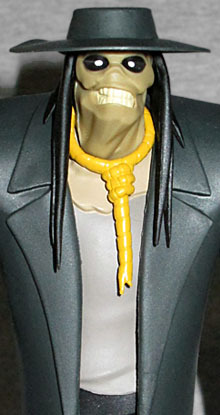 Scarecrow's hat, hair, and coat are made from flexible PVC, as is the noose around his neck. That was a new creation of this design, by the way - it was common for him to have a rope around his neck, but it was always just a way to tie his bag-mask closed. After Bruce Timm turned it into a noose, that almost become the standard choice, being used in the comics, in the movies, and in the videogames. It makes sense: it takes what would otherwise be a standard, unremarkable element of any generic scarecrow design, and turns it into something slightly more frightening. Part of the reason for the BtAS redesigns was to save money: fewer lines on the characters make things easier to animate, and fewer colors cost less to paint. The new Scarecrow is tall and lean, with very wide shoulders and arms that dangle out of his torn sleeves. The original design had tan boots and gloves, brown pants, a ruddy shirt, a tan mask, and a light brown hat with an orange band (the first redesign also added yellow hair and a tan belt); this one has black shoes and pants, light gray skin, medium gray shirt, dark grey coat, yellow rope, and a brownish mask. Like the face, the body was usually draped in shadow, but that can't work here. Scarecrow has all the articulation we expect from this line: a balljointed neck, swivel/hinge shoulders and elbows, swivel wrists and waist, H-hips, hinged knees, swivel boots, and swivel/hinge rocker ankles. The design of the head makes it function more like a swivel than a balljoint. The figure is actually thinner than the animation model, but it still looks good. 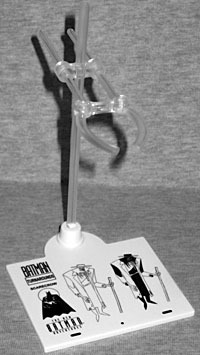 Since his coat is flexible, it doesn't get in the way of the joints - while the Adventures of Batman & Robin version was always bent in weird directions, the New Batman Adventures version was more of a stiff, looming threat, so you may not be tempted to do anything really crazy with him anyway. If you do want to go nuts, he of course includes one the of doll stand display bases - but its efficacy really must be questioned, since his waist is so wide. It's like the problem Two-Face had, but even worse. You almost have to turn him sideways to get the clamp around him at all! DCD really should have consdiered the shape of the characters before finalizing the style of the figure stand. And while the stand uses the same "adjustable clear clamp/white base" combo as all the rest, his base doesn't feature turnarounds, but rather two versions of the same art: one with shadows painted on, and one without. How very odd! The figure has four pairs of hands. He's wearing fists in the package, then has three pairs that are clutching to various degrees, allowing him to hold each of his other accessories: a stick, a gun, and a spray can. The stick is shorter than it should be, but the other two have just the right amount of detail. Swapping the arms is very easy, too. This is a nice Scarecrow figure, but we're still holding out hope that they make a toy of his old design - maybe with a variant head for a "first appearance" look?